Normally, we know the name of the Founder of Islam by only his first and most known name: Muhammad (S.A.W). But, for most Muslims, we know him by many names. And there is his longer name, which many Muslims too, know of – which traces his name way back to Adam, the first man on Earth. Prophet Muhammad was born in Makkah as a fulfilment of the prayer of Abraham. The first was authenticated by biographers and genealogists and states that Muhammad’s genealogy has been traced to ‘Adnan. The second is subject to controversies and doubt, and traces his lineage beyond ‘Adnan back to Abraham. The third version, with some parts definitely incorrect, traces his lineage beyond Abraham back to Adam [AWS]. Muhammad; Ibn ‘Abd Allah; Ibn ‘Abd al-Muttalib; Ibn Hashim; Ibn ‘Abd Manaf; Ibn Qusay; Ibn Kelaab; Ibn Mor’ah; Ibn Ka’ab; Ibn Lo’ayy; Ibn Ghalib; Ibn Fa’hr; Ibn Malik; Ibn Al’Nadar; Ibn Kenana; Ibn Khuzaymah; Ibn Modrakah; Ibn Elias; Ibn Modhar; Ibn Nizaar; Ibn Ma’ad; Ibn ‘Adnaan. 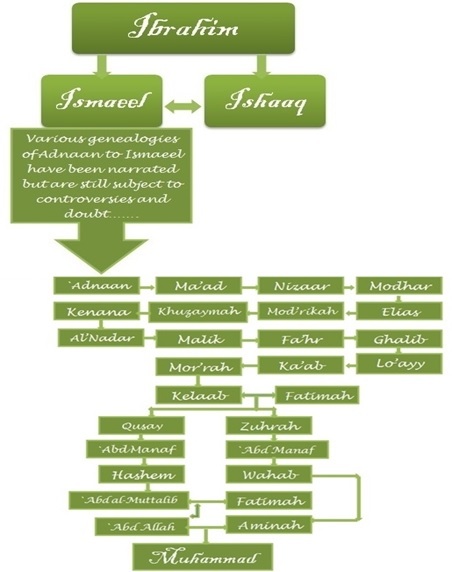 Most renowned Muslim scholars and ulamaa agree with Rasool Lal Lah’s (صلي الله علية وسلم) name, tracing his family lineage up to ‘Adnaan. But after ‘Adnaan, there are many doubts and controversies. That’s why most Muslims – even scholars, when asked to name him through his family lineage, they would only prefer to give names up to ‘Adnaan.